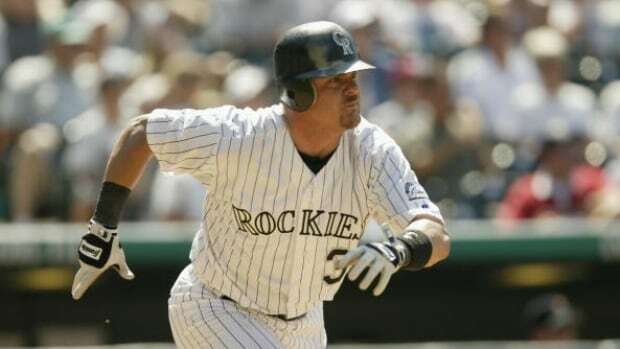 Larry Walker has good reason not to worry about hall-of-fame induction. "I already am, baby," the retired Canadian slugger said. "I'm in the Canadian Sports Hall of Fame, I'm in the Canadian Baseball Hall of Fame, the B.C. Hall of Fame, the Colorado Sports Hall of Fame. I am a Hall of Famer. "But I get what you're saying there. Cooperstown's the ultimate one." Entrance to the Baseball Hall of Fame would further affirm the Maple Ridge, B.C., native's status as the greatest Canadian hitter ever. Canada's only current Cooperstown compatriot is pitcher Fergie Jenkins. The 52-year-old grew up with dreams of being a goalie in the NHL. He played road hockey with Hockey Hall of Fame members Cam Neely and Billy Smith. Walker's brother Carey was drafted as a goalie by the Montreal Canadiens, too. Still, Walker eventually made the decision to trade in his goalie mitt for a baseball glove. Seven Gold Gloves later, it's safe to say he made the right call. The right fielder's career path got off to a rocky start. As a teenager in British Columbia, competitive baseball wasn't always readily available. In fact, Walker had never really faced a breaking ball. "That was the main reason why I went to Mexico to play [after the 1987 season], to learn how to hit off-speed pitches," Walker said. "It took a year longer because that's where I tore my knee up and missed a whole year. But after that, I learned how to do it. I went to, I think, four or five [fall] instructional leagues with the Expos to continue learning how to play. Practice, practice, practice." Walker's .400 career on-base percentage is a testament to his quick learning. He also finished his career in 2005 with the 1997 National League MVP trophy, three batting titles, three Silver Slugger awards and five all-star appearances. He was the first Canadian to earn MVP honours, paving the way for Justin Morneau and Joey Votto to follow in his footsteps. He has the eighth-highest on-base-plus-slugging percentage of all time, behind six Hall of Famers and Manny Ramirez. It's hard to look at Walker's Baseball Reference page and not wonder how this guy is still lingering on the hall-of-fame ballot in his ninth year of eligibility. In 2014, Walker slumped to 10.4 per cent of the hall-of-fame vote — well below the 75 per cent benchmark. By 2018, he'd only risen back to 34.1 per cent. He surmises that spending 10 years playing for the Colorado Rockies in the notoriously hitter-friendly Coors Field hurt his cause. "There are things to take into [account] with me, and I just look at the negative ones for some odd reason," Walker said. "I realize I played at Coors Field, I realize that injuries are part of my career. If people don't look at that as hard than it makes it an easier decision maybe to just look at the numbers and put that checkmark. But I have those little black-cloud areas that get looked at." Yes, Walker's numbers did slump away from home — but slumps from mountainous highs still make for pretty good numbers. It also bears repeating that Walker would be the first Canadian hitter in the Hall. Vince Carter is largely credited with the rise of basketball's popularity in Canada. Walker had a similar effect, ushering in an era of Canadian baseball that features the likes of Morneau, Votto and Russell Martin. That Walker spent the first four years of his career playing for the Montreal Expos, and was part of the what-if team of 1994, helps too. Being the first great Canadian hitter should matter. Baseball north of the border is part of the story of baseball — especially in the last 30 years. Like the impact of Dirk Nowitzki on basketball in Germany or Soviet star Vladislav Tretiak's transcendent hockey career, the stories of those sports can't be told without those trail-blazing athletes. 2019 marks Walker's second-last year on the hall-of-fame ballot, and it seems as though voters have hopped on the bandwagon. According to Ryan Thibodaux's Hall-of-Fame tracker, Walker has accrued 67 per cent of the vote from the nearly half of voters who've publicized their ballots. Typically, players' percentages fall from the tracker to the official results. That makes Walker's final year of eligibility a crucial one. "Next year, it's not a super-strong ballot, so if I can sneak onto a few more votes, then there's a possibility," Walker said. "It makes it exciting. I'm having fun with it." Whatever happens, the self-proclaimed hall of famer isn't letting it bother him, and doesn't plan on promoting himself because he doesn't have "that bone in [his] body." "I'm from a little town in Maple Ridge, never thinking I was going to play major-league baseball. Now I'm on the ballot for my ninth year, and I'll be on again next year for the final year. Gosh, in my eyes, that's somewhat of an accomplishment and brings me a lot of joy and happiness that I've been able to do that. "So, not making it isn't going to knock me down."